Work with a Name You Can Trust! If you DON’T want a consistent award-winning REALTOR® working for you, then DON’T talk to Linda Folsom. It didn’t take long for this real estate veteran of 13+ years to start making her mark in the industry. She attributes her success largely to her key objective of bringing a positive, can-do, dedicated attitude to every situation and of striving to make her clients’ real estate experiences positive and enjoyable. Prior to her career in real estate, Linda served as a travel agent for AAA Travel for 14 years, and was consistently on the list of top 10 salespeople in a 7 state area. She also worked for Amax Coal Company as an underground miner for 14 years. If that doesn’t scream hard work, we’re not sure what does. Since joining F.C. Tucker Emge in 2005, Linda continues to be a multi-million dollar producer each year. Born and raised in Gibson County, Linda still lives there with her husband of 34 years. 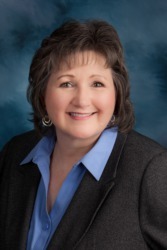 If it’s a trusted, award-winning, REALTOR® you’re looking for, Talk To Linda Folsom! She will treat your real estate needs with the same care and attention to detail as she would her own.